Please use HF5RC3 in the mean time. So scratch everything we did before (to those of you who updated fine like I did, you may forget this post - well maybe except for the new package installer that takes care of VoodooHDA installation as well). 1) Mac OS X 10.6.3 Combo Updater from Apple's site. 2) HPM311DP_HF5RC3.pkg - I renamed this installer repacked by me to continue (and NOT undermine) the legacy that is left of the HP Mini 311 Darwin Project. In case things don't go well after the reboot - that said, you create this tool BEFORE running the 10.6.3 Update, or if went ahead already, at least before restarting your machine. 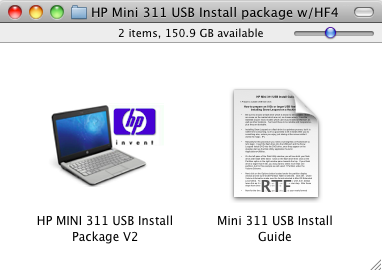 3) HF4 USB Booter - which you make by installing *HP Mini 311 USB Install Package w/ HF4 on to a USB flashdrive that you know and have tested to boot your 311 fine. NOTE! 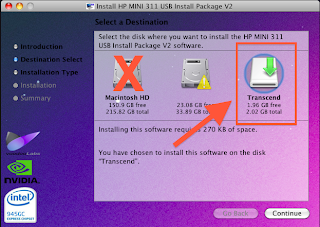 Make sure you install the package onto the USB flashdrive and NOT your internal hard drive. 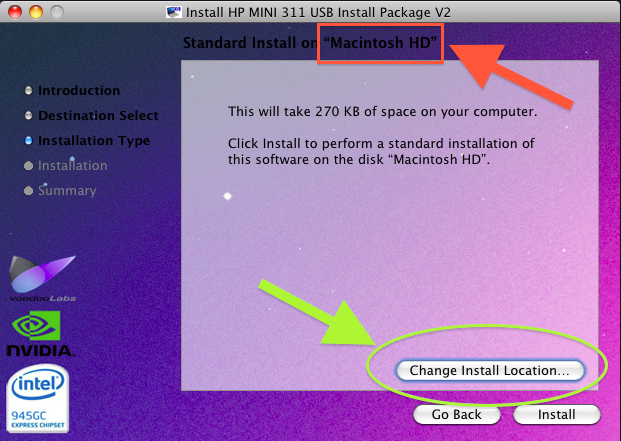 The pkg defaults to your current OS X install (internal) disk which you would want to change very much. In short, don't just click absentmindedly as you, I, we all normally would but please do read this time, paying attention to details - specially that pertaining to the install location. 1) Run the Mac OS X 10.6.3 Combo Update. DO NOT RESTART yet. 2) Install the HPM311DP_HF5.pkg. DO NOT RESTART yet. A) Your Mini 311 restarted just fine but your trackpad isn't working. => No worries, it's just that ApplePS2Controller doesn't really load in -f mode. Also beats the hell out of me why it behaves likes that. Just restart your machine, but this time, just let it do it's own thing and you should be fine. B) Your Mini 311 is experiencing a "boot loop" problem. => You created that "HF4 USB Booter" right? Right?? If you didn't against all my insistence for you to do so, but you can get to another hackintosh or Mac and create one, now, while it isn't too late and proceed to B.1. Or if you can't get to another hackintosh or Mac (nope, a PC won't do cause I don't want us to go as far as there), please jump to C.
B.1) Use "HF4 USB Booter" to boot your Mini 31. => Press F9 as you turn on the machine, choose your flashdrive, press Enter, and choose your internal hard drive, press Enter. B.2) Reinstall Chameleon (Cham2NBI - by Meklort). (2) run this applet I created for you "Reinstall Cham". Tank you for your post, it's nice to see that there are people working on the 311. I was meaning to ask, how long battery life do you get in OS X? I've heard rumours of 2 hours and less.. which admittedly doesn't sound so fun. I'm afraid the rumors are more or less correct. It's around 2.5 - 3 hours for the 311 based on my experience. The screen is very bright so you might wanna set that lower, and also turn off AirPort when not in use to save up on juice. Hi! Thanks for the guide!! Battery Life, in my experience, grow up to 3.5 hours max! And I think it's great! Good luck to you then! An advice on the partition: when you boot off with the Win7 DVD installer, you'll see a message below the dialog box telling you that you can't install Windows in that MS-DOS partition you just made. Just click on "partition" and then click OK when the warning message appears (data will be lost blah blah on that partition). Then just click on "Next". Let the machine boot back into Win7 until you've configured your user account and see your Win 7 Desktop. Now is the time that you fix Chameleon. Boot up with the Win 7 DVD and after selecting the language, press Shift+F10 to bring up the command prompt. boot up again with the Win 7 DVD installer. This time we'll activate EFI partition as well. press Shift+F10 to bring up the command prompt. restart your machine once more and now you should be able to load Chameleon. Press F8 to refresh Cham's disk list. Hey, Thanks a lot for the useful directions! The only thing that I can do is to use the automatic system repair from the Windows 7 DVD. I'm trying different methods to repair all things. 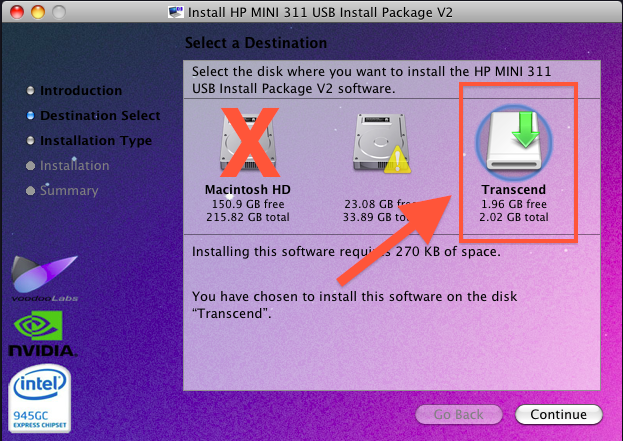 Hmmm I believe when I ran the HP Mini 311 10.6.3 installer it may have unloaded my EFI partition? It now goes through says loading Darin x86 and then just reboots. Tried booting the HF4 bootable disk, and booting it from there and same thing. Or is it just a kernel panic? then restart again to activate EFI this time. Yeah, all things goes right with your instructions! Thanks for all this stuff. My Mini311 with SnowLeopard 10.6.2, has updated automatically with apple software update and I has not any problem. Could I do any aditionals steps for get more battery or anything? Now I'm wating for a new BCM94322 HP brandend bought in ebay to try to have the wireless lan enabled, with actual BCM94312 I can't do it, I can't rebrand, I can't update bios to try something, any ideas? that's really interesting. So you updated via auto sys update and when you rebooted, you didn't experience any of that boot loop issue? Could you confirm? It might be the answer to how people should update. Thank you very much for the instructions - it's much appreciated! I was able to load the Retail copy of SL with no issues, however (and I blame this on the fact I am VERY MUCH a newbie) I can't get 10.6.2 or 10.6.3 to load properly. Whenever I go do the auto update, it installs everything, however, when it reboots, I get a Mac drive that has a pulldown menu with several boot options. No matter which you pick - or if you pick none at all - it keeps rebooting itself. Any step-by-step ideas for someone as inexperienced as I am? can you guys comment on the cpu fan activity? In my 10.6.3 machine (built with a combination of nbi 0.8.4 RC1 and other kexts/dsdt) the fan will kick in very soon after boot and never turn off. Any ideas? Thanks for the tip regarding the .pkg installer... dissected it and even though i don't use an hp mini (im eeePC 1005HA), i was able to find the root of my boot KP: the EFI (i dunno bout sleepenabler though, but i kept the new one). I've been using the hacked 10.6.2 kernel from teateam up till i stumbled on your blog, and was surprised to find out that you still use the vanilla one, thanks to the EFI injected by netBookInstaller 0.8.3 and later 0.8.4. As for the random kernel panics, did you re-org the locations of the default utility apps? I stopped having em when i moved them back to the utilities/ directory. I got a clue from monitoring the console, twas telling me it couldn't find activity monitor. P.S. thanks too for the wi-fi rebrand hint. at first i would thank all guys working on that project!! I have the same phenomenon as Ricardo Luis said. At my first install with OSX i updated my 311 via Apple Auto Update. No Kernel Panics or other strange things. Only Sound wouldn't work. So i've found this new How-To and made a reinstall of my system. After installing 10.6.3 and HPM311DP_0410HF5RC1.pkg i dont get access to the boot option with F8. So on, the System started successfully but i have no sound again. Press any key while Chameleon loads. As soon as you see that rotating cursor of sorts at the top most left edge of your screen when you press on the power button, press and hold any key if F8 won't work - Enter, Spacebar. It will work. It should work for you. It worked for me and I wasn't imagining things up. Oh and the reason why you want to interrupt Chameleon is because you wanna initially boot with -f flag to ignore previous system caches. i just installed OSX 10.6 with your how-to LeMaurien. I have problems with the graphic. The welcome screen is very lagy. Must i install any graphic files to get full support of the graphic adapter. After reboot I have no experience any problems, all is alright. But you are in the right, no problems with boot loop, or anything, but I have no audio. Could you tell me how I can restore the audio? As I have not got audio, searching in google I found and installed http://www.tonymacx86.com/Public/10.6.2-AppleHDAInstaller.zip from it. After reboot, booting with -f and now my fabolous mini does not boot well. PS: I decided Install all from the scratch to try to do better. What is the OS recomended, Snow or Snow leopard?, thanks. Dami pa ring nagkakamot ng ulo a. Here's what i have though. Try: If you used NBI, Rebuild your extension caches with that shoe-icon-app in your /Extra/ folder. 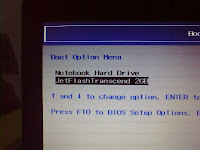 Please do not confuse "Netbook BootMaker/Netbook Installer" with "EFI boot" - they're different setups. 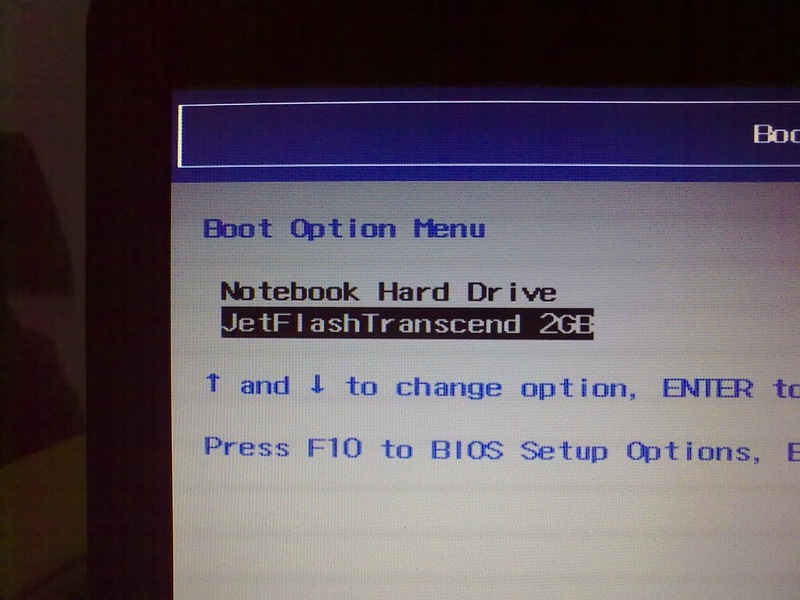 This guide is "EFI boot". Netbook BootMaker: stores /Extra/Extensions on main "/" directory, on the same level as System, Library, Users, etc. What about booting in verbose mode? Are there any new insights? Mon Compaq (malheureusement pas "Hp" Mini) a tres bien supporté le hackintosh avec ton guide. J'ai cependant une petite question de perfectionniste^^ Voilà, apres avoir installé TA version de chameleon (HPMini311 HF4 -i v1.1) j'ai trouvé mon systeme tout bonnement parfait! Ce theme est magnifique! C'etait super...jusqu'à l'update en 10.6.3v1.1.. (je n'ai jamais pu installer la 10.6.2, allez savoir pourquoi..). Quand j'utilise ton utilitaire "reinstall Cham" tout se passe bien, et je peux booter normalement.. Cependant, ton theme est maintenant tout moche^^ Il n'y a plus la "spinning weel" au debut avec l'icone, mais plein de lignes de commande qui avant etaient cachées..
Merci beaucoup d'avance, et tres bonne continuation! Quant à ton petit pb avec le "spinning wheel" manquant, c'est parce que ton boot mode a été changé en verbose - d'où les lignes de commande que tu vois à l'écran. Normal car sous 10.6.3, le hibernate ne marche pas sans verbose. En fait c'est le HF5 RC1 qui change le boot mode et pas "reinstall cham". Mais si tu veux absolument pouvoir booter en mode graphique (avec l'icône pomme et spinning wheel), t'as qu'à accéder à la partition EFI et modifier le fichier com.apple.Boot.plist. Launce Finder, et tu devras trouver un disque EFI dans la Sidebar. Cliqu là-dessus, et tu vas voir un dossier "Extra" dans lequel tu vas trouver com.apple.Boot.plist. Double-clic pour l'ouvrir (normalement c'est TextEdit qui va se lancer). Chercher le key "Kernel flag" et supprimer le string "-v". *Si tu arrives pas à enregistrer, tu peux copier com.apple.Boot.plist sur ton Bureau et ce sera ce que tu modifies avec TextEdit. Puis remplace le fichier d'origine dans EFI/Extra avec celui-là. Attention car dès lors tu ne pourras pas mettre la machine en sommeil et puis la réveiller sans avoir un kernel panic. Si tu prévois de mettre ton compaq en sommeil, il faut spécifier -v verbose mode au chargement de Chameleon. Sinon, je me propose pour une traduction de tes guides en français. Je sais que tu pourrais surement le faire, mais j'ai un peu de temps libre, donc si ca t'interesse.. Thanks for all the amazing work and the great help. I hope that you can help me resolve one lingering issue that is driving me mad. I was running 10.6.2 beautifully. I followed this guide to upgrade to 10.6.3, and everything still works except that now I can't resume from sleep, even with verbose mode. Then, I went ahead and did a full install figuring that would clear up any conflicts I was missing. I installed 10.6 from usb, then H4, then the 10.6.2 combo update, disabled secure virtual memory and restarted. I tested the system, and everything, including resume from sleep was working well. Next, I installed the 10.6.3 update, then the H5 RC1 pkg on this page. I restarted, and everything was working except for resume from sleep again. Just for the hell of it, I went ahead and re-installed the H4 pkg and restarted. Sure enough, I could resume from sleep with no problem, but, of course, there is no sound with H4 and 10.6.3. So it seems that I can have everything with 10.6.2 and H4, or everything except sound with 10.6.3 and H4, or everything except resume from sleep with 10.6.3 and H5 RC1. Of course, what I really want is everything with 10.6.3 with no exceptions, but it's making me crazy. Can you offer any further tips on troubleshooting this? Perhaps you could tell me how to just fix sound in 10.6.3 without changing the sleep and power kexts? Or, could you point me to the specific method for getting to 10.6.2 that allowed you to then progress to this guide? Any suggestions are greatly appreciated. I'm afraid I can't offer you anything else. This is what works for me, I'm only sorry it didn't work for you. For your information, for one, HF5 RC1 is a, well, Release Candidate. Meaning the team (yes, there's a bunch of people who are willing to put effort on this to help others get OS X on their Mini 311's as well) is still in progress of finding out what's best for 10.6.3. Also contrary to your claims that HF5 RC1 installs new PowerManagement kexts, I'm telling you it does NOT. It's basically HF4 (which I only got from the original HP Mini 311 Darwin Project by theproto). If you really wanna vent out your frustrations on sleep/resume, take it out on Cupertino and the developers of 10.6.3 update - it's the same thing I want to do cause they had to make 10.6.3 a problem for the HP Mini 311. For installation procedure, find it in this very blog. Everything I ever did on my system is in here - no trickery, no secrets of the trade. To finish off, I invite you to join us in the HP Mini 311 Darwin Project thread and learn along with the rest of the team. Bizaaaaare ça. Normalement si tu vois le spinning wheel, tu doit voir aussi la pomme. . .
Tu peux consulter ton com.apple.Boot.plist encore pour vérifier si tu as "Boot Graphics"=Yes là-dedans. Thanks for the super quick response. Please understand that I didn't mean to vent my frustration at you, I was just venting in general. I am eternally grateful for all of the help that you've already provided. Your blog has been an incredible resource for me, and I'm certain that countless others feel exactly the same way. Thank you. I think my trouble might have something to do with my specific 311. I almost gave up when I was trying to flash my bios because I kept finding the exact same steps on every guide, and those steps failed on my system every time. Then, I found a post that mentioned some 311s now ship with a 2 MB bios instead of a 1 MB bios. I kept digging, eventually found a modified 2 MB bios, and it worked instantly. Now, with resuming from sleep in 10.6.3, it seems like I have another problem that almost no one else has. I'll report back if I find a solution, but I'm getting tired of experimenting so I'll probably just go back to 10.6.2 for a while. Anyway, if it weren't for you and people like you in the community, this stuff would be completely impossible. Please keep up the great work, and thank you, thank you, thank you. I didn't know about the 2MB Bios. I did find it weird when digging inside F.14, I found two files: a 2MB one and the other 1 MB. So the newer 311's use the 2MB bios file. A friend's 311 got bricked cause he flashed it with the 2MB one when it's the 1MB he should've used. I used this guide to update to 10.6.3 but now i get a kernal panic caused by sleepenabler. How can I fix this? Try using HF5RC3 instead. I'll have a look at HF5 again. First we need to get you to your desktop so you can run the installer. For that, use the HF4 USB you were instructed to create to boot up your Mini. I already reinstalled my mini and got it up to 10.6.2. Should I try te guide again but this time with HF5RC3? Yes, try with HF5RC3, it works. If you must really update to 10.6.3 - understand that you should only boot verbose mode in 10.6.3 because it's only that way that sleep is stable. We're struggling with non-verbose mode boot (graphical boot) in the InsanelyMac development thread. I tried again using HF5RC3 but I still get the same kernel panic. I actually don't really need 10.6.3, I just want the speedstepping and ion to work. I have OS X and Windows 7 on my 311. I'm locked out of OS X because I guess by installing Windows it got rid of Chameleon. So I followed your diskpart steps to activate certain partitions but when I rebooted it said "Missing operating system". Not sure how to repair this. Could you help me out? Thanks for the .iso, but I didn't use it. Before I read your comment, a few hours ago I used my flash drive which contains Windows 7 on it to boot and I repaired the startup problem I was having. I'm still blocked out of Snow Leopard because Chameleon is not showing up. I still have theproto's old HF4 laying around but I don't have access to a Mac. I also don't have an external CD/DVD drive. Is there any way to restore Chameleon back on my 311 using a flash drive? Many thanks. You have a Windows PC? Create a MultiBootISO USB with BootCD-altPS2.iso inside. You can use this guide. BootMyISO is the old name/version of MultiBoot but it works the same way. oh and just replace "HPM311DP_1109CHF4.iso" with "BootCD-altPS2.iso", if you hadn't done that already. 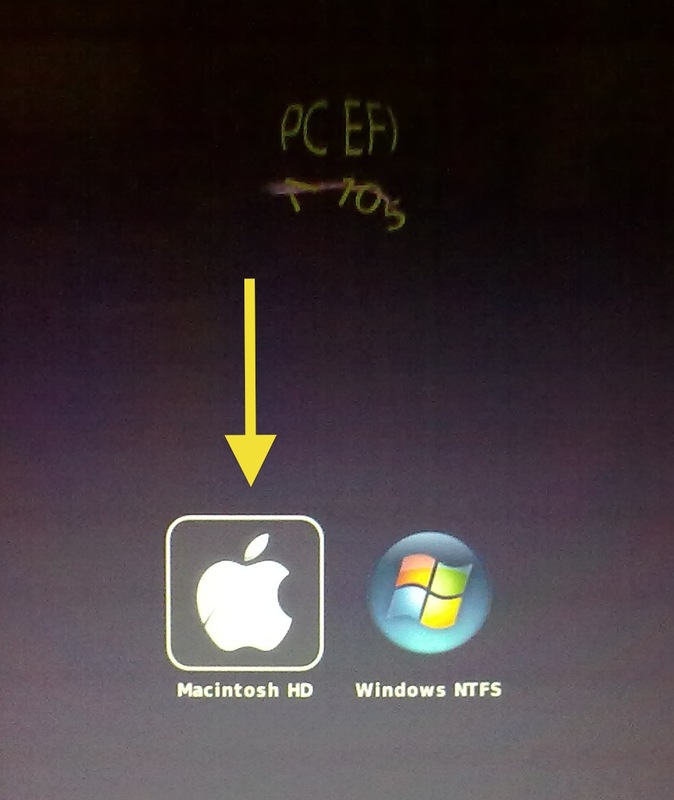 Check if your installations, both Mac OS X and Win 7 are still ok. Still running 10.6.0 on my mini and does everything for me :) No interest in updating unless the updates improve battery and performance? I have everything working on my mini ie: sleep, sound, webcam etc) It just gets really hot compared to a windows boot with the mini fan sounding like a 737 getting ready for take off most of the time. I'd like some advice. I have installed Snow Leopard on my HP Mini311, works well, have resolved the sleep issue, no problem. However whenever I install the upgrade for iLife 08 to iLife 09, I always get a kernel panic at the point of installation when the installer is running the package scripts. Does anyone have any idea what needs to be tweaked to resolve the kernel panic?